Post updated for 2019. Now I do know, that there are some good aussie web hosts in Australia , but if you are starting out with a new website or blogging site and need some cheap hosting then it would be wise to do research before buying your webhosting. I have used a mix of aussie hosts and US based web-hosting providers in my list below and prices for blogging software and web-hosting can certainly differ a lot between these hosts. US web-hosts can be quite competitive and affordable compared to some of our local Australian companies. I got this question asked to me on this blog ..
“I am planning to start a blog, most likely using the wordpress blogging platform and I am looking for a good web host (Australian preferable since most of my content will be for Australians). I have purchased .com.au domains from smarty host (local aussie provider –now netregistry) when I started my bloggin journey, they used to provide a website hosting service as well which i never tested out . Net-registry are pretty good with their domain names service, however if you want to compare Australian web hosting prices against the US based providers. Some of the US based providers are definitely more affordable even with domain name prices(check my blog post where I recently bought .au domain name from Godaddy at a nice discount price here). Godaddy also sell SSL certificates which help you secure your website and get https in your url (this help in ranking your website). Their custom plans also feature SSD hard drives now. Below, I will also include smarty host(netregistry) in my comparison chart for Australian + US hosting providers packages. Dedicated servers are not listed as they are more pricey and only shared plans which are affordable have been featured here for bloggers and beginner websites . I will rank them in order of my ratings and preference with the best at the top of this list as per my experience with them, except for smarty host who I don’t use for hosting but just domain names – who is right at the top. I have been using the rest of the Hosting companies mentioned for the last 10+ years while blogging. Some of these hosting plans listed below, also offer a bonus free domain name. Go Daddy’s has Reliable Web Servers and their 24/7 available tech support is always handy. They have a free trial website builder package. Price: AUS$ – 30%* off! 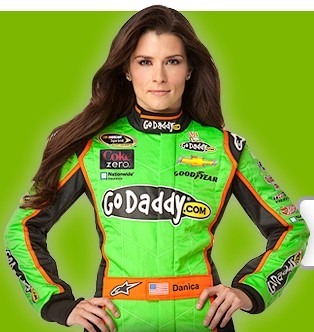 Get going with GoDaddy! They also provide discounted domain name deals. *Promo code also applies to two year plans taken.This promo code adds 1 extra FREE lifetime domain registration to any plan signed up for with it! Affordable “Australian-based Web Hosting” and domains Provides Domain Name Registration & Websites. 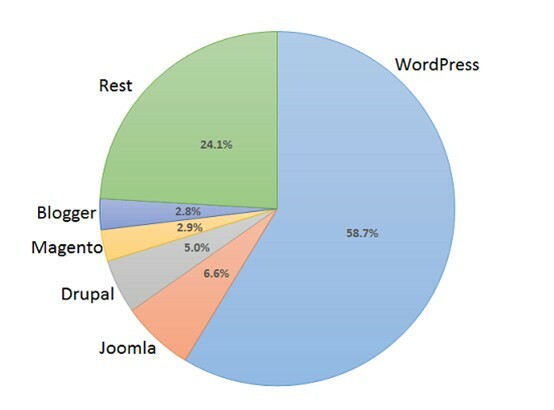 The figures in bar counter diagram are figures from self hosted managed CMS platforms aggregated from online resources. The below figures in circle chart are for websites from data received form survey done online. WordPress is the most popular CMS in the world and is used by nearly 75 million websites. According to WordPress, more than 409 million people view more than 23.6 billion pages each month and users produce and whopping 69.5 million new posts every month. It also powers more than 25% of the world’s websites. The first thing to do when you are starting your own website rather than hiring a website designer or web developer, is to get the WordPress platform to build your website. 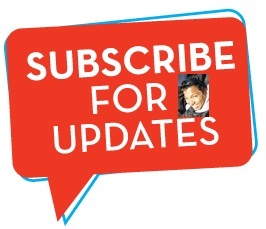 This platform is regularly updated to keep you safe from hackers and upto date with the latest version of wordpress. I say this because I have also used Joomla and Drupal website builders which are good content management systems, but they are not as good as the WordPress platform in ease of use and flexibility to customise as per your needs. The ranking above is based on my use of these service providers based on price, reliability, affordability, up-time, features, ease-of-use, server speed and overall support. There is always the option to use premuim Australian Web Hosting from good companies like rackspace or crucial, but budget shared US hosting is OK if your are just starting a blog or website. You can also get an .au domain name and still use US Webhosts to host your Australian webpage. Why hostgator is good for blog hosting? Shared web hosting is what most people mean when they refer to “web-hosting”. It simply means that many customers’ websites reside on a single web server, and that the server’s resources (CPU and RAM) are shared among every customer account on the machine. Shared Plans is cheap because many people share one server. Most shared hosting plans listed above offer free quick install scripts like above in the pic and sometimes also offer free design templates for your webpage, Free domain email, FTP, $100 google adwords bonus and Facebook advertising coupons etc. HostGator recently launched their new, premium hosting called HostGator WordPress Cloud. 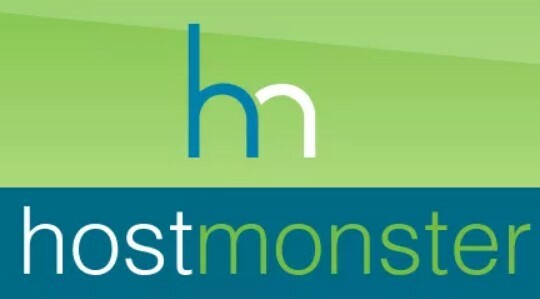 HostGator has been around since 2002, originally founded by Brent Oxley before being acquired a decade later by Endurance International Group (EIG). Bob Parsons the founder of godaddy is a serial entrepreneur. He sold his first company to Intuit, Inc. in 1994. Three years later Parsons started Jomax Technologies, renaming the company GoDaddy in 1999. In 2000, GoDaddy became an ICANN-accredited domain name registrar. Designated CEO Now: Scott Wagner (Jan 1, 2018). They have many different kind of plans. While Deluxe and Unlimited WebHosting Plans support and host unlimited Web Sites, owners of single plans may experience periodic decreases in performance once they more than 400 Web Sites. The Sydney-based company has focused on delivering a better experience for customers, with the roll-out of an industry first concept; Managed Google Apps. 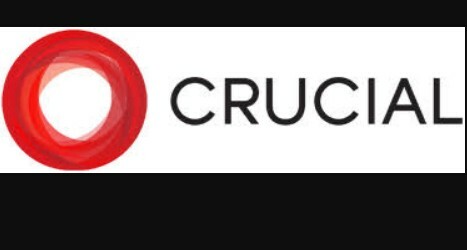 Crucial’s roots trace back to a student bedroom in Bondi in 2003 where the company was first formed, and its headcount currently sits at 20 employees before the AVS buy. Some of the links on this blog are affiliate links an I might earn a commission from it , rest assured the review is honest and written from my own perspective. The Webhosting features and pricing are as current at the time of writing and links when clicked will update to the most current advertised or discount deal. I hope, I have helped you in choosing a good hosting provider to get started building your website. After getting your domain and hosting sorted , there is just one more thing left to complete the picture and make it all come together , which is your blog design and look. A good professional looking wordpress theme is essential for people to get attracted to your blog and also trust and like you blog. Check out my review post on some of the wordpress theme providers I have been using for a long time. To be fair, though, we still use these services even if we weren’t an affiliate. We don’t recommend any particular host just because we’re an affiliate (every company offers a similar affiliate program), we recommend certain services because they are the best or better more reliable option. Plus, because we’re a partner, these providers offers a special price for Digitalgrog.com.au readers. Get your hosting today and get started. Because we’re a partner, Bluehost offers a special price for digitalgrog.com.au readers: only $3.95 a month which includes a domain name. We already have our godaddy $1 special offer listed above i.e if you are looking for a cheaper deal. I found the cheapest provider to the public at only $59.99 per domain (2 years registration included – I think this is pricey ), they had a really nice site, great functionality (they create redirecting email address’ on their servers that randomly generate so you don’t get spam from who is lookups which is awesome). 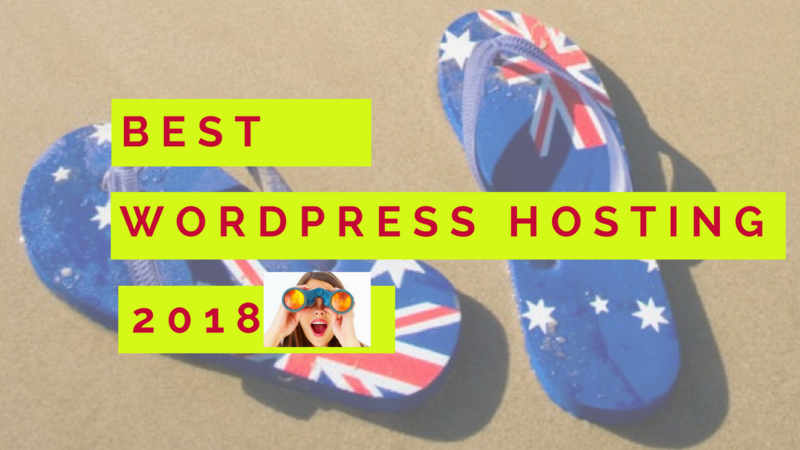 Great to be featured here 🙂 There are quite a few more Australian hosting providers that are worthy of this list too. The article focuses a lot on pricing, which is important for many, but ‘value’ goes beyond that. – Does a provider offer WordPress specific support? Do they help you troubleshoot a dip in performance due to a plugin misbehaving? – Is their tech optimised for WordPress for security and performance? How well does a WooCommerce shop run on a $2.50 a month plan? – Where is your customer data stored? Does that impact your customer’s privacy? Really very helpful and appreciable article. These comparison are great its gives us a better idea of choosing between Australia and US hosting. The comparison for the prices also helps a lot, Building a WordPress platform can a bit challenging but thank you for this post it was very conducive. thanks for that comparisons! finally have an idea about the hosting in Australia.. These ways are very simple and very much useful,as a beginner level these helped me a lot thanks fore sharing these kinds of useful and knowledgable informations. Thanks buddy for the $1 godaddy deal .. just the cheap deal i was looking for starting my new blog on a budget. Much appreciated. Thanks for sharing most useful information with us.. Thanks for sharing..one of the best list received from you..
Nice write up ..i need to start a food blog. Do you think these hosting companies are good bluehost or godaddy cant make up my mind. The issue with the price comparisons here are that credit card transaction fees for US purchases are not included in price, and in many cases are about the same per month as the hosting price. You buy anything from US they have credit card transaction fees. That’s how it works online. This is very informative post i really appreciating You.. I got this web page from my friend who informed me about thgis website and at the moment this time I am visiting this web page and reading very informative content here.